Innovation is an integral part of the corporate culture at ZinCo, which is why we collaborate regularly on various research projects with third-level institutions and other partners. In cities extreme temperatures and weather are occurring with increasing frequency. The restoration and redevelopment of integrated “blue” and “green” infrastructure could help to reduce the impact of such events and simultaneously increase the value of the land. Blue Green Dream (BGD) aims to develop the service infrastructure to implement the use of this adaptation solution. Soaring temperatures and extreme weather are having a significant impact on cities. The effects of urban heat islands and uncontrolled or inadequately planned urbanisation are amplifying the combined stresses on urban life. The reduction of green space and urban water corridors, are arguably one of the drivers. City decision makers, urban planners and water engineers should consider how water systems and vegetated areas can be better integrated together to make cities more habitable and resilient in spite of climate change. 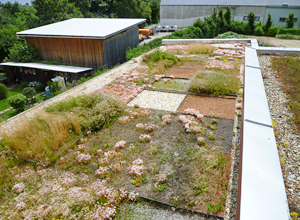 Green roofs, as “ecological air-conditioners”, are meant to contribute to the improvement of the thermal environment in urban areas. Therefore, in addition to heat absorption, the cooling effect of green areas through the evaporation of water or, as the case may be, grey water, becomes central. 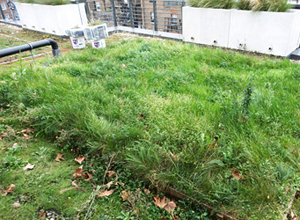 Grey water from households could provide an alternative, continuously available and weather-independent source of water supply for green roofs. Tests to examine this proposal are being carried out in conjunction with the University of Weihenstephan Triesdorf. First of all, grey water samples are analysed in order to assess the basic suitability of this water. 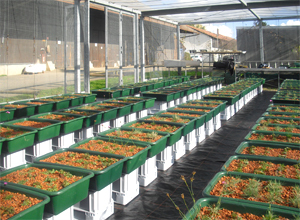 Then, tolerant plants with as great a potential for evaporation as possible are identified during plan trials. Finally, those systems intended for practical application are assessed for their suitability. Duration: February 2012 to January 2015. 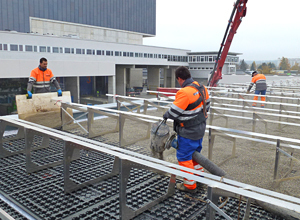 To measure the electricity generated with PV systems on different types of green roofs in order to establish the perfect combination of green roofs and photovoltaic system. To enhance biodiversity. 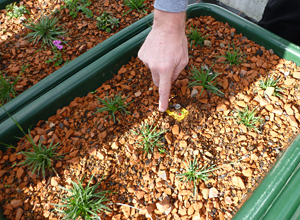 The aim is to find the perfect combination of plants for the green roof, solar cells and irrigation management without losing sight of maintenance requirements. With this variety of species, flora and fauna are examined in order to allow conclusions to be drawn about their ecological significance. 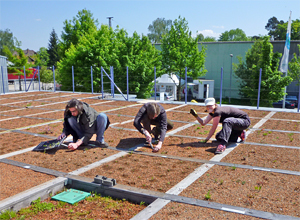 Measuring the electricity generated in the course of the day and at module level will provide us with detailed findings on the influence of the various types of green roofs. The electricity is measured DC-side before the inverters. Duration: Start of pre-test June 2012, main test at the Scheidegg facility from autumn 2013 to June 2015. The aim of the project is to achieve an innovation and turnover boost in the greening of buildings and percolation capability of pathways. 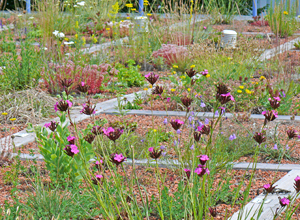 The design of green roofs and façade greening and percolation-capable pathways are examined, as are new designs. 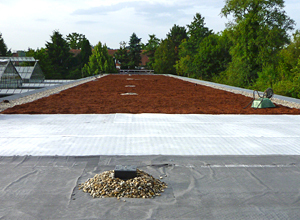 With regard to green roofing, microclimatic, water management and thermal protection properties and vegetation development are examined in detail. Using a model town, the properties and effects of design on the water balance and the microclimate are calculated and their medium to long term significance simulated with the help of climate models. On the basis of the findings from these simulation models, targets for urban climate and water balance are derived and spatial planning instruments are developed for the authorities to enable these goals to be achieved. Moreover, a study will provide evidence of the effects of greening on the value and the saleability of real estate. On the basis of a cost-benefit analysis, a planning guide will be created for developers and new relevant funding regulations for residential building will be drawn up. Duration: 1 July 2010-28 March 2013 – extended to the end of September 2013. Basic research on individual layers of green roof system build-ups (drainage, substrate, plants) and also in combination as a system build-up. 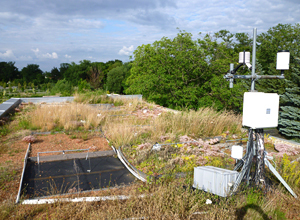 A research project taking place over a period of four years in three work packages as basic research investigating the function and effectiveness of green roofs. The project examined, for example, water transport within the system build-up and the evapotranspiration performance. 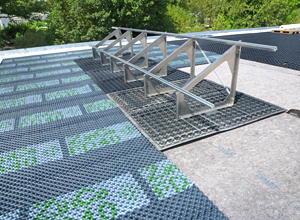 Testing was carried out in labs, using rainfall simulators and on two test roofs (Sheffield and near Nürtingen). On conclusion of the project, the research findings were presented at a conference held in Sheffield in April 2013. Duration: Start 2009, duration 4 years. End 04/2013. Funded by the EU as part of the programme “Industry-Academia Partnerships and Pathways” (IAPP) in the 7th Research Framework Programme. 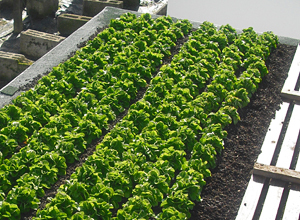 Plant screening with regard to three different substrate depths. The perennials, grasses, semi-shrubs and succulents are observed and rated. 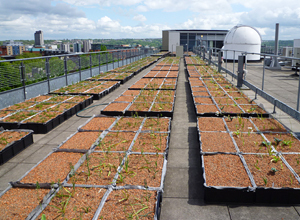 Comprehensive tests on green roof vegetation. 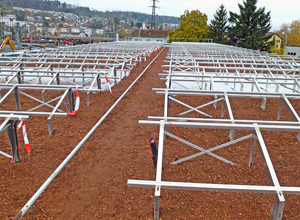 Demonstration areas for urban farming and the combination of green roof and solar. 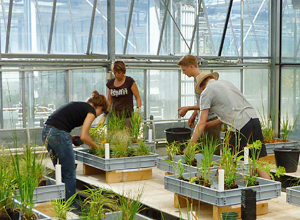 Across an area of more than 750 m2, a total of ten different system build-ups and plant communities are tested. In addition to testing the most promising plants resulting from the EU research project “Green Roof Systems” (3 different substrate depths), the topic of solar in combination with green roof and also urban gardening are to be displayed as a demo. Duration: Start summer 2013, indefinite duration. Planting spring 2014. 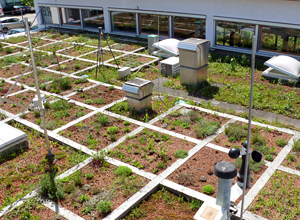 Cooling effects of extensive green roof vegetation – long-term measurement in the form of experiments with individual plant types and plant combinations. 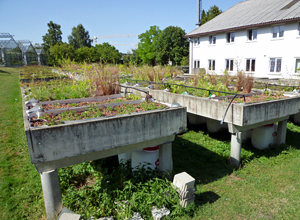 In Hohenheim, standard green roof build-ups with differing plant growth habits and combinations of these were set up in test containers. The water run-off quantity of each container is measured regularly. In addition to findings on the cooling effect, this allows for conclusions to be drawn on the effect of each vegetation on water run-off behaviour. Duration: Start 1 July 2013. End 31 October 2014. 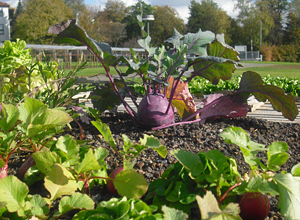 Sponsored by the State of Baden-Württemberg within the framework of the programme "Climate change and model-based adaptation in Baden-Württemberg (KLIMOPASS)"
Demo project on the topic of urban gardening. Build-ups with differing substrate depths and application examples on the topic of urban farming are presented on the roof areas of standard garages. Duration: Start late summer 2013, duration indefinite.